Individually tested at 10,000V, guaranteed safe at 1,000V (EN60900:2012). Kraftform design 2-component handle for comfort during intensive use and increased power transmission. Highly durable bit-grade steel blades for extreme wear resistance and longer life. Set contains: SL 2.5 x 80mm, 3.5 x 100mm, 4 x 100mm, 5.5 x 125mm, PZ 1 x 80mm, PZ 2 x 100mm and mains tester 3 x 65mm. 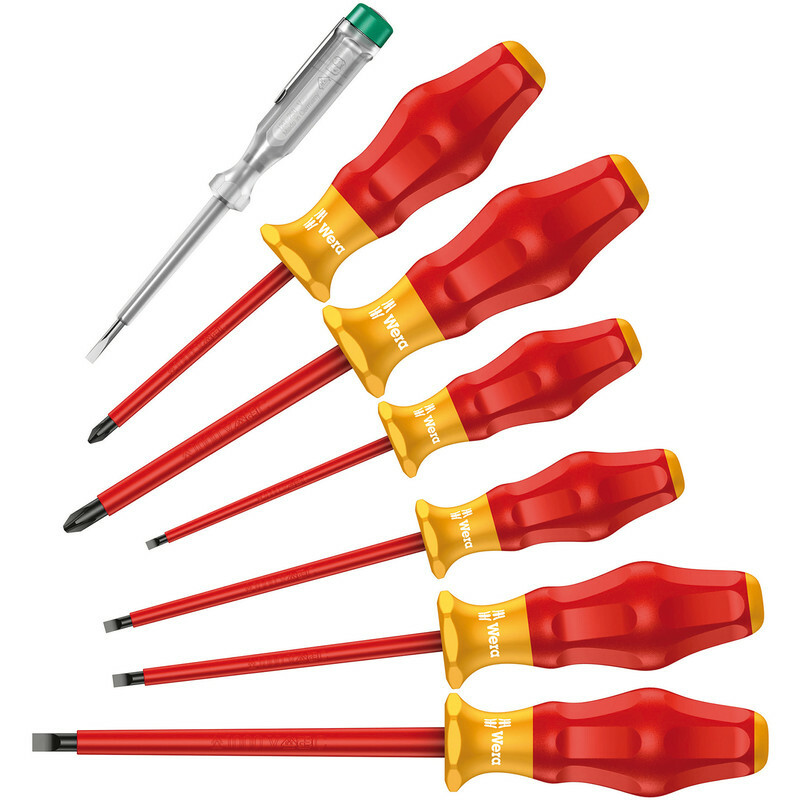 Wera Kraftform Comfort VDE Screwdriver Set (7 Piece) is rated 4.9 out of 5 by 16. Rated 5 out of 5 by Longhouse from Very comfortable to use & superb quality Bought these whilst on offer and on the basis of advice from others who have used the Wera brand. Can't say I'm disappointed at all. They have a quality feel and weight to them although I don't know about the tester screwdriver as I always use a proper GS38 approved tester and proving unit. These are comparable with other well known German makes I've used and own and definitely feel better to uses than some "Expert" series drivers I have, although to be fair, they haven't let me down yet either. Rated 5 out of 5 by Obergroupenfurah from Quality Been looking for a quality set of VDE screwdrivers for some time and could not believe my luck when this set were available at a significantly reduced price. Rated 5 out of 5 by Anonymous from Quality I use precision screwdrivers set made by WERA, I use every day to laptops repairs. Indestructible tools. Rated 5 out of 5 by RayC1 from Look good Looks good. Not used yet.